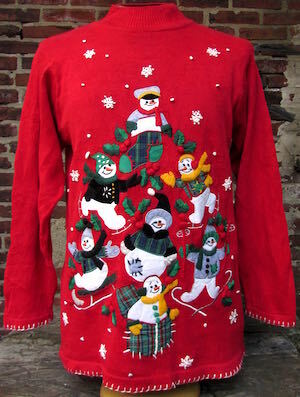 Ugly Christmas pullover sweater. Bright red knit with a Christmas tree-shaped jumble of wintery snowmen (wearing mittens, hats & scarves, 'cuz, you know- they're cold). 3-D red holly berries, and snowflakes. Tag reads BP Design. Ramie/Cotton. Condition: Very Good. Small brown stain on the lower right side. Does not detract from the awesomeness of this sweater.